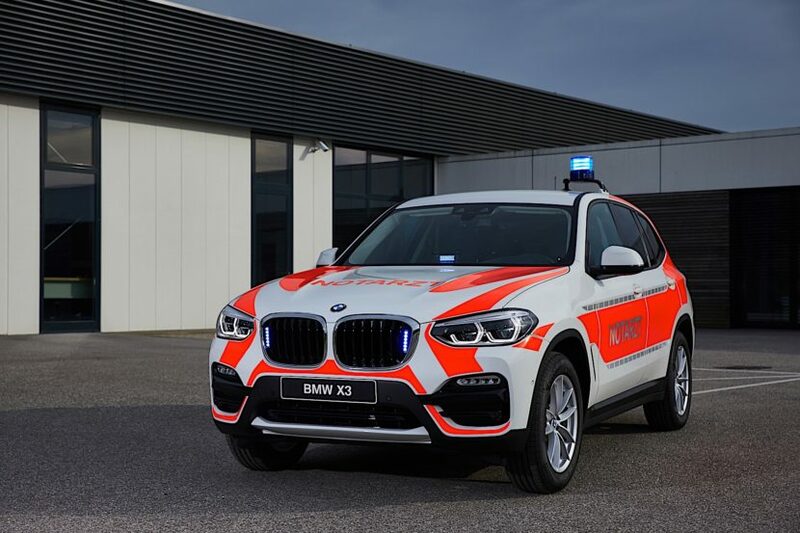 BMW has been part of the RETTmobil exhibition for years and for 2018 the Germans decided to unveil their take on how a BMW X3 would look like in Emergency Vehicle clothes. 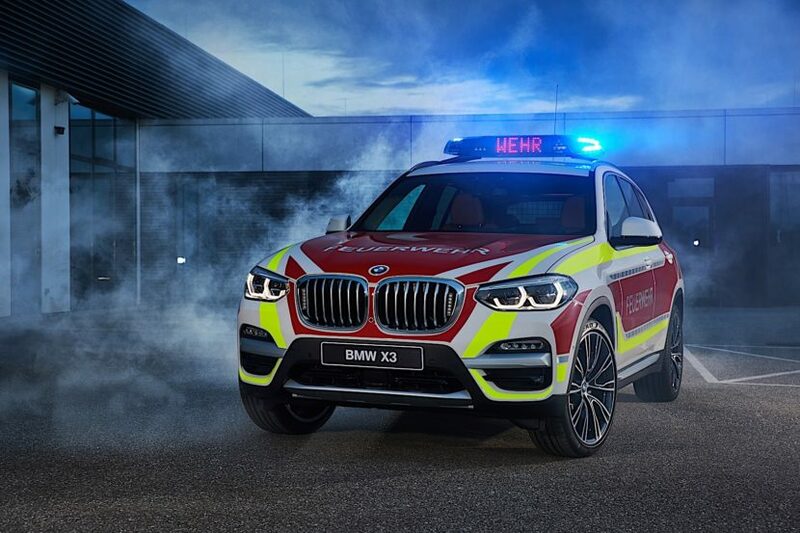 The X3 will be shown in two guises: as a fire service command vehicle and as an emergency ambulance. Alongside it, at stand No. 208 in Hall 2, visitors will also have the chance to see more specially designed BMWs for Emergency Services. The RETTmobil, which is being held this year for the 18th time, is again recognized as the leading European exhibition for emergency services and mobility and as a worldwide significant forum for innovation, security, quality, competence and advanced training. For many years now, the BMW Group has been one of the major exhibitors at the RETTmobil, and this year, with six different models on two and four wheels, will again provide a detailed insight into its diverse range of specialized vehicles. Alongside the BMW X3 visitors will also get to see the BMW 2 Series Gran Tourer, which has been converted into an emergency ambulance, as well as a BMW X1 as an additional fire service command vehicle. Moreover, BMW Motorrad will be exhibiting a BMW 750 GS converted into a police motorcycle. 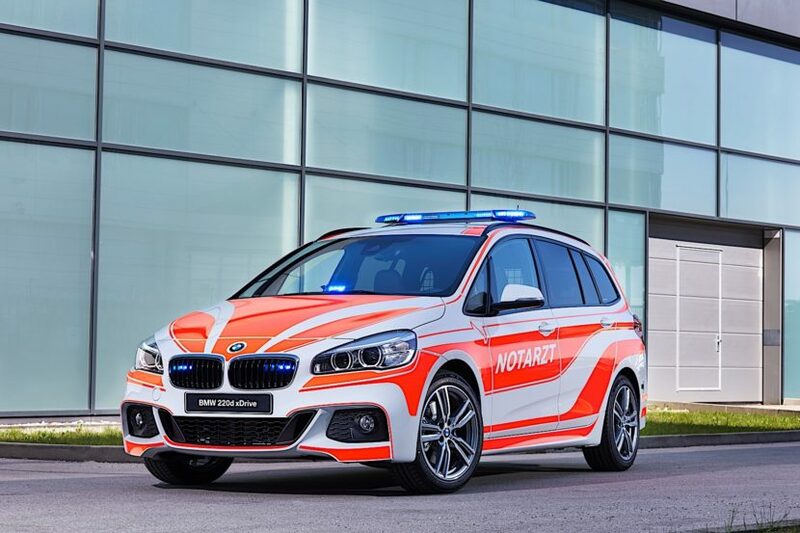 BMW Group’s fleet at the RETTmobil will be completed by a MINI John Cooper Works show car in a police version. The X3 fire command vehicle comes with “Fire Department” lettering on the side of the vehicle, on the rear lid and bonnet. In addition to a roof-mounted special signal system designed for fire service use, the vehicle is equipped with blue LED front flashers and flashers in the luggage compartment lid for better recognisability and for the protection of rescue teams. Also onboard is a 230-volt main supply socket, two 12 volt DIN power outlets in the luggage compartment, a permanently installed charging device for the supply of electricity to both vehicle batteries as well as a 2-kg fire extinguisher mounted inside the rear compartment. Also wrapped in signal foiling, boasting the exceptionally bright colour RAL 3026, a further BMW X3 xDrive20d is being exhibited at the BMW Group stand at the RETTmobil 2018. The lettering “Emergency Ambulance” on the side panels, at the rear and on the bonnet provides clearly visible indication of the vehicle’s intended purpose. A removable omnidirectional beacon with socket hinge and two blue flashers at the front and rear guarantee the necessary attention of other road users during an emergency deployment. The spectrum of equipment also includes a pre-fitted digital radio fixture for a MOTOROLA system. For the fastest possible drive to a deployment location, the emergency physician can rely on the information supplied by the navigation system Business. Increased comfort inside the vehicle is guaranteed, inter alia, by 3-zone automatic climate control, heated seats and lumbar supports for driver and co-driver. All this sounds interesting and all but the one car which will attract the most attention will definitely be the MINI JCW Police car. 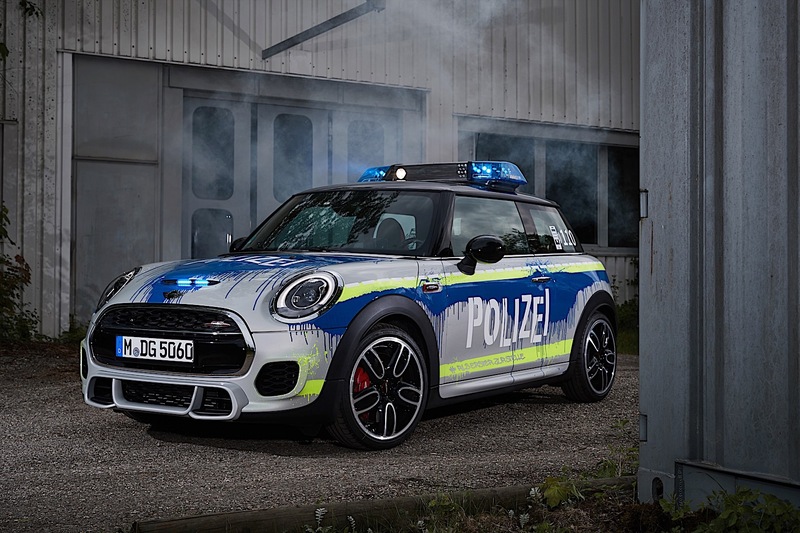 Unlike the other cars which have been modified to be actually usable in emergency situations, the MINI John Cooper Works Polizei car is just for show, receiving an interesting makeover on the outside. The RETTmobil 2018 is set to take place between May 16 and May 18 in Fulda, Germany.